So you can tune or live-view anywhere, on any device, even on trips out! 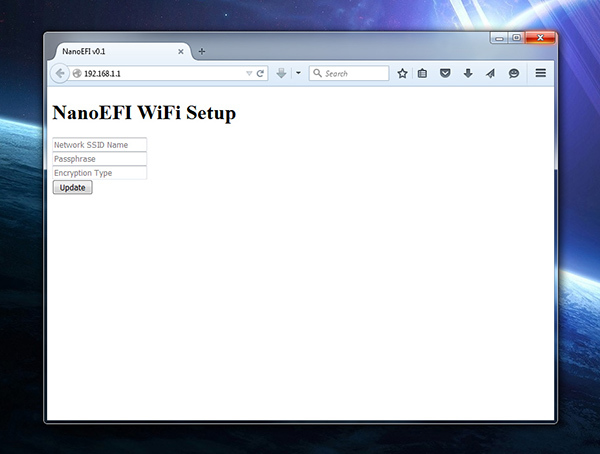 At first it was thought that the tuning tool suite should be hosted remotely on the nanoefi.com server, pulled through an iFrame or similar method. But after exploring the capabilities of the ESP8266 module, it was found we can reliably host the tuning tool suite directly from the NanoEFI unit itself, simplifying development and security concerns. The best part? 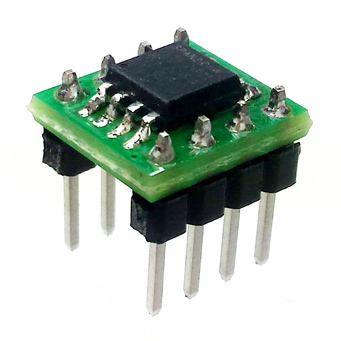 The ESP8266 supports SoftAP (Software Access Point) mode, meaning that it can act as a stand-alone POA without any external network to facilitate connection. In SoftAP mode, any device can securely connect directly to the nanoEFI system anywhere in range. Even miles away from the nearest network! This transforms your vehicle into a mobile tuning hotspot, for making easy adjustments to the tune on the fly from any device in range. Tune from desktops, laptops, or even your mobile phone! 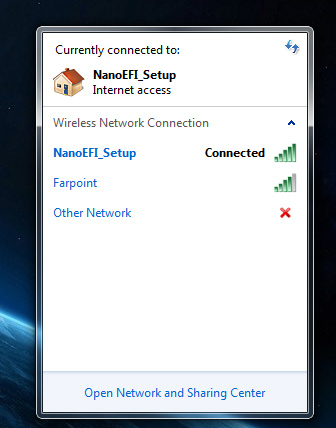 You can see the NanoEFI SoftAP, and connect to it. Type “192.168.1.1” into your browser and hit enter. You’ll be greeted with the basic configuration panel. From here you can enter credentials for your home network with internet access, data that is stored in internal EEPROM and which will later be used for pulling software updates and other internet-based features. Since the Arduino Mini / ATmega328P is limited to 32KB available memory, there is isn’t enough space to host a modern webpage, dependencies, and image resources. Let alone still having enough space for the code for EFI functions. This tiny SMD chip gives us 32 megabits of additional storage space. Which works out to 4 megabytes. Plenty of room for multiple HTML pages, CSS stylesheets, and a nice framework like jQuery Mobile. And there is enough room left over to store handy libraries like Highcharts for really useful graphs to view operation data, even in real time. After having soldered the expansion to this adapter, I’m ready to add it to the breadboard and start integrating it into the system. Be back soon!